I spent two days this spring at the Cambridge Ellis School in Cambridge, MA as part of the Ann Murphy Artisans Program. I worked with children from ages 2 to 4. After I enthusiastically agreed to go, I stopped. I wondered what making books with a class of two-year-olds would be like and then thought, what have I gotten myself into? It turned out to be great. There was lots of staff to help and Jodi Crawford, who is in charge of the arts at the school, was terrific. As I prepared, I enlisted the help of my friend Kathy Charpentier who has been doing day care for years and has a good understanding of the capabilities of children at different ages. The project we came up with was a simple four page accordion without a cover. The children created imagery for their pages by placing pieces of colored paper on a sheet of exposed clear contact paper and then placing the contact paper on the accordion page. I got the idea for this from something I did with my daughter years ago at the Children's Museum in Boston. In honor of the Children's Museum and its reopening after renovation, the links this month connect you to Children's Museums around the country and their offerings of activities to do at home. You will need one long piece of sturdy paper or cover stock or the back panel of a brown grocery bag cut in half vertically, clear contact paper, a piece of scrap copy paper, tape, and an assortment of small pieces of paper cut or torn in to different shapes. Cut four pieces of clear contact paper that are a little smaller than the size of the accordion pages. Remove the backing and tape them, sticky side up, to a piece of scrap paper. Place an assortment of small pieces of paper in trays. Fold a four page accordion. For the two year olds, I precreased the folds so they could still do the folding steps but didn't have to worry about making the folds even. Have the children arrange small pieces of paper on the contact paper. If the paper has color or an image on one side only, it must be placed with the image side down. We told them to hide the picture. The surface of the contact paper should not be covered as there needs to be adhesive showing to make the contact paper stick to the accordion. Place one piece of clear contact paper on each page of the accordion and smooth down to help it adhere. 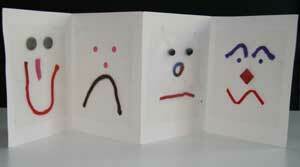 Make a face on each page showing different emotions/moods. Make an accordion shaped like a butterfly and cut the contact paper to fit the wings. The Educators link has pdfs to download of some interesting projects, including Chinese shadow puppets and The Nose Knows. Lots of good activities for children in the classroom and at home. The Units of study are divided into K-2, 3-5, and 6-8. K-2 offerings include All Aboard: Trains in History, Folklore, and the Future and Dinosphere: Now You're in Their World. A series of articles and activities in four categories: Playful Learning, Growing Up Healthy, Language and Literacy, and Exploring the Arts. 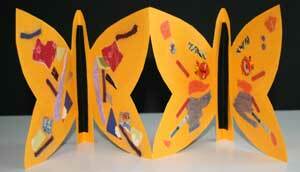 I have two open workshops coming in the fall on making books with recycled materials. One will be at the Center for Global Studies at Framingham State College on October 20 and one will be at the Fiber Art Center in Amherst, MA, date to be determined. Details will follow in future posts. Susan, how neat and what fun that must of been. Love the idea. I appreciated very much the face book :-) I hope I can use it with my kids next year. Bye!